When you embark on a long-term project you’re never quite sure if it’ll be finished at a seasonally appropriate time or not. Luckily this one has arrived in time for Spring. The pattern is Ready for Spring by Yellowcosmo – when I found the pattern on Ravelry, I added a number of other Yellowcosmo patterns to my favourites list for future. Her designs are just my thing (a bit of asymmetry, geometric lines or a quirky feature without being too eccentric). I’m normally heavily influenced by the colours used by the pattern designer but I actually already had this yarn in my stash (Tosh Merino Light in Button Jar Blue). It was intended for a different project but I didn’t like the drape with the correct gauge so I had to find a new pattern for this yarn. 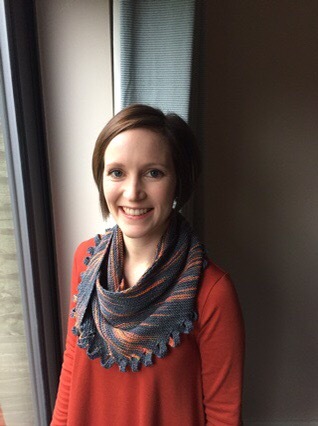 I’m pleased with Ready for Spring pattern – it’s a good match. There are three sections of lace plus some ribbing in the back. It was my first time with a lacy pattern and it took a bit of getting used to. I found myself making plenty of mistakes and having to go back to fix them. My favourite lace pattern is the one across the bust. I’d like to lift this from the pattern and use it on something else. My only change was to add just a little shaping for waist and arched back – sneaking in some decreases evenly over the side and back. I’m two dress sizes smaller at my waist than hips so even with the open style I’d have ended up with a ripple of sway back fabric without this. 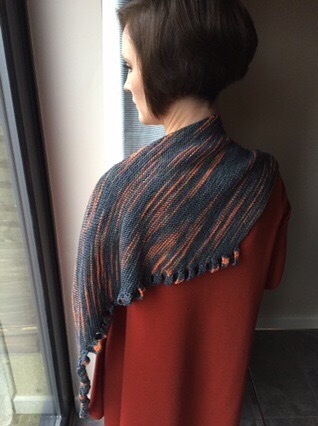 Do you have any tips for me… specifically blocking a cowl collar. Although I’d like to upgrade from blocking on a towel to a foam mat, I’m not convinced that’s why the cowl collar didn’t block well. 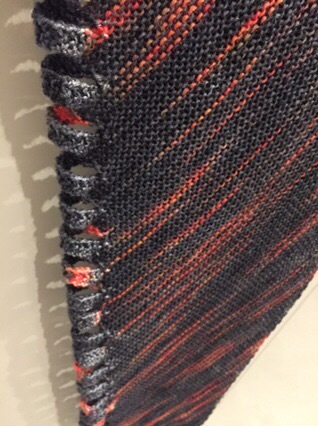 It couldn’t work out a good way to pin for blocking and consequently it dried with ripples. Nevertheless, I’ll have plenty of opportunities to try some other blocking methods on the collar because I’m going to be wearing this a lot. After knitting socks without a hint of second sock syndrome, I appear to have acquired a compulsion to knit in pairs. Although not matching, these hats seemed a logical double project. When a wool band reads “Born, Bred and Made in Yorkshire” and you are born, bred and made in Yorkshire, you know immediately you have to buy the yarn… in three different colours. I don’t think I’ve been as excited or impulsive about a yarn before. Serious warm fuzzy feelings inside and out. Ramsdale is Yorkshire wool (all 100% of it) from Masham fleece. Not only that but each of the 12 shades are named after Yorkshire market towns or villages. I bought two red, one navy and one neutral. Also known as Settle (amazing walking), Hawes (highest market town in England, I don’t even know why I remember that fact) and Malham (location of too many Geography school trips but I can still appreciate it’s natural beauty). As if hailing from North Yorkshire wasn’t enough, this yarn has great qualities… good squish, soft without pilling, not scratchy and nice to knit with. The hats; ombre and Latu. Ombre because I was itching to try stranded colour work without committing too much (I’m not ready for a full on Fair Isle Jumper project yet) and Latu because I really liked the neat cable pattern. 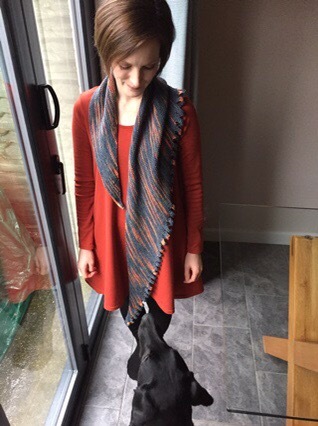 Both are free patterns – I’m always terribly grateful that knitters share these patterns so generously on Ravelry. 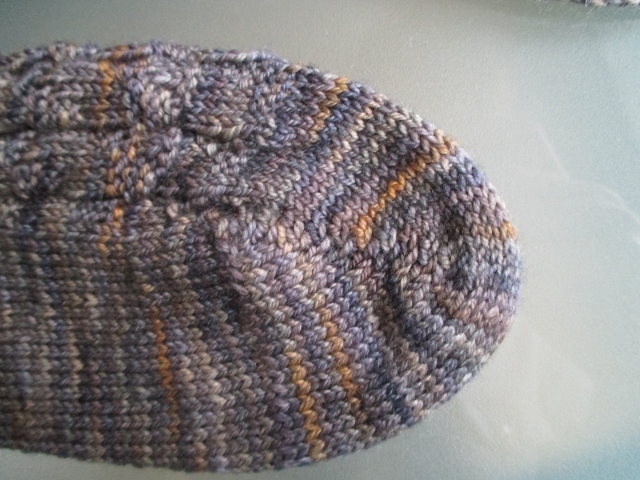 I had did use some of the second ball of red making the hat but there was plenty left for a pair of wristwarmers. 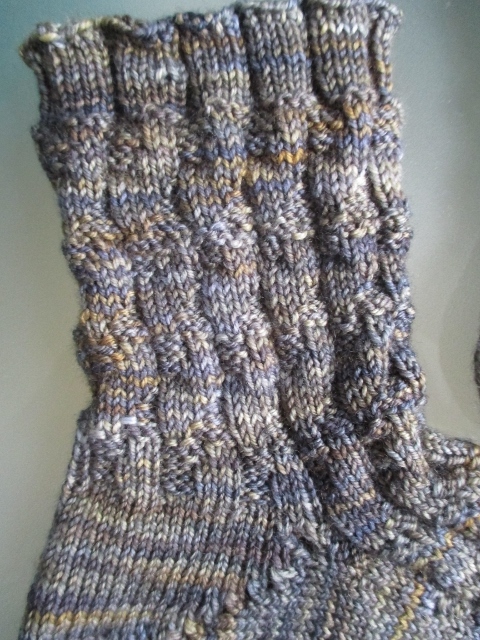 I fudged the cable pattern of Latu onto a gauge adjusted version of Anna Wilkinson’s wristwarmer pattern. These are knit flat and seamed afterwards so I knit with both ends of the yarn at the same time until I had just enough left to cast off and seam – I hate waste! 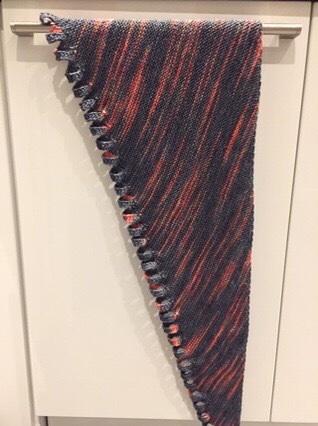 Last week: “No second sock syndrome here” was the phrase a very accomplished knitter proclaimed when I revealed at my first meeting of a local knitting group that I was indeed making my first pair of socks and the one on my needles was the second sock. Let’s rewind to the summer when I received a wonderful birthday present of two Craftsy Classes. Socks have been on my knitting techniques list for sometime. On one hand the shear amount of choice is overwhelming: construction, toe-up, cuff-down, DPNs, circulars, two at a time, yarn choices, stitch decisions. On the other hand, with knitting, I have found it is best to jump right in, no new technique is too challenging when the worst case scenario is ripping out to start again. Donna Druchunas’ Craftsy Class “Knit Original Toe-Up Socks” seemed pitched at about my level: Fearless sock beginner not afraid of a steep learning banana. 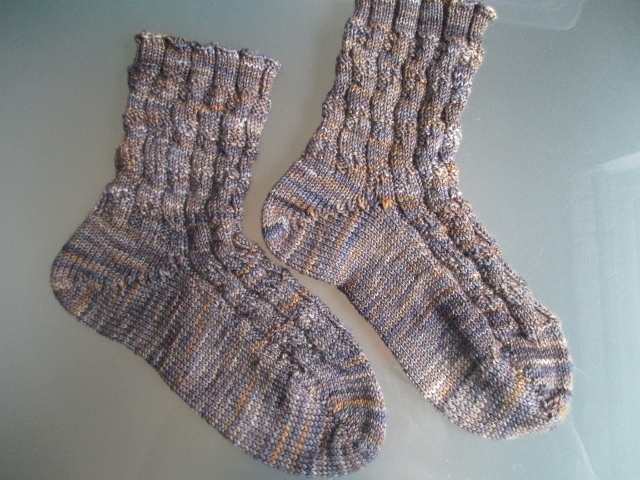 The class seemed to have longevity that would take me from knitting my first pair to designing my own. The course materials aren’t well advertised but do add value to the cost of the class – three multi-sized sock patterns, some additional stitch patterns and a planning worksheet. In the short-term, chapters on sock anatomy, calculating for a good fit and fully demonstrated toes and heels gave me enough information to knit my pair of socks. That fit. Successfully. Now that my first pair is complete, I can return to the class to tackle another of the 3 toe or 3 heel options or maybe use the bonus section on knitting two socks at a time. I’m not quite ready for designing yet but altering an existing sock pattern seems do-able and Donna gave some great tips along the way for knitting for gifts if you don’t have the recipient’s measurements. Enough of me waxing lyrical about the Craftsy class, lets talk about the pattern. The Seaweed sock pattern looks, to me, like the bobbly dark green seaweed that I remember washing up on UK beaches when I was a kid. 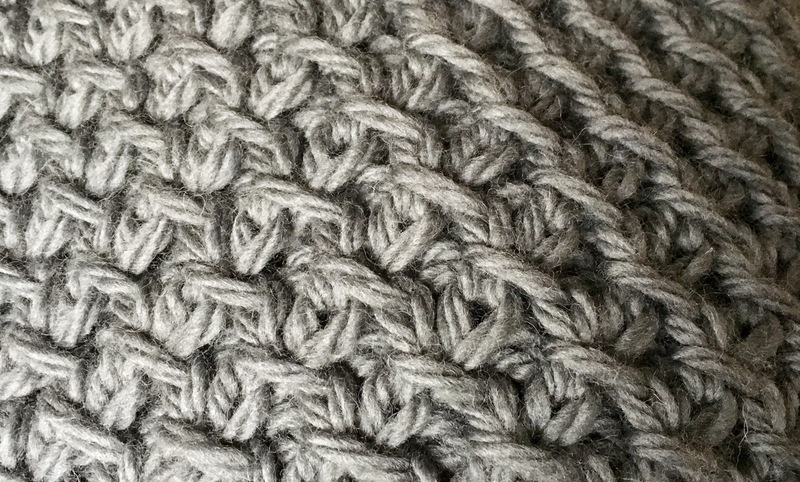 As stitch patterns go, it’s not too complicated to knit (although I didn’t manage to memorise it, I had to keep the chart with me at all times) yet very visually effective. I see it as a unisex pattern – some of the patterns that incorporate lace seem a bit girly to me. This sock pattern has a short row toe and heel which are fairly similar to knit so are a good way to consolidate learning. The yarn is Malabrigo Sock in playa which I purchased from Tangled Yarn. The fact that the pattern and colourway were sea themed amused me. It is incredibly difficult to photograph but is predominantly dark green and navy with highlights of gold, grey and grey-greens. The new-to-me knitting group did warn me that sock knitting was addictive. 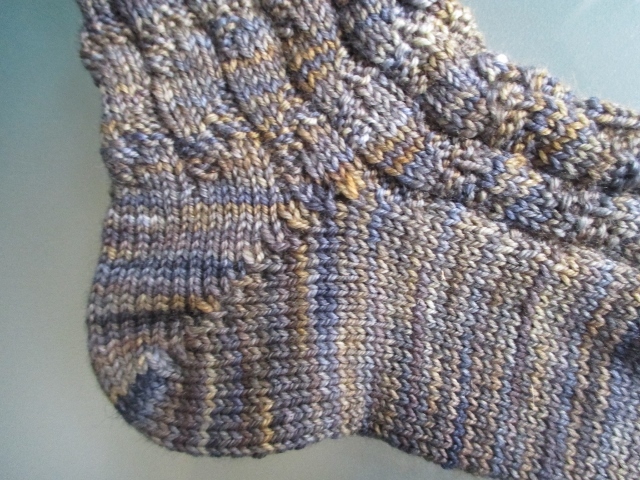 I have hats in the pipeline but do see more socks in my knitting future.